The following report was authored by Agent ████, one of the top personnel involved in the containment of SCP-1082. Despite being contaminated by the object, the agent was able to disguise his symptoms long enough to compose and publish this report. The publication of this document on open servers resulted in a containment breach, infecting ██ Foundation personnel. All affected personnel have since been recaptured and given amnestic agents. Agent ████ resisted containment and was terminated. This is a picture of the book and good luck. Presupposing that one wished to stop others from gaining access to the book, the way it could be accomplished would be that This book is to be locked in a metal box that cannot be opened except through the use of three different methods, with the intent that this make the book difficult to access. The box that this book is kept in is itself to be kept in a room in a building known as Site 38, particularly at the coordinates of [REDACTED FOR SECURITY PURPOSES]. As the above-listed requirements should make clear, the Foundation for which I work does not want anyone to use or get at the book unless those people are scientists that work for the Foundation and are using the book only to find out more about the book so as to better keep others from getting to the book. Pictures that people take of the book also can have the same effect that the book has, but I don't think they know that yet, because I decided not to tell them. I think I might tell them tomorrow, but I also may not tell them at all. 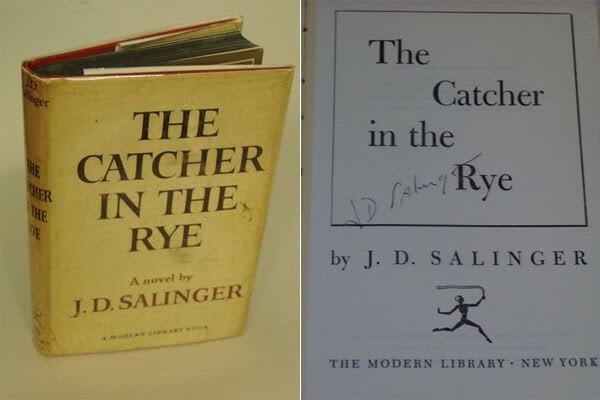 If I were to describe the book, I might do so by saying that This book is a copy of The Catcher in the Rye by J.D. Salinger. The title page of the book has been signed by the author and an inscription at the bottom of the title page has on it the words "To Jack, here's to making the world better." The words on its copyright page indicate that the book was printed in 1977 in Chicago. The book keeps you honest. Not only can you not lie, you cannot avoid the truth no matter what you do. There are many ways to deceive others, and once you see this book, you are no longer capable of any of them. You cannot lie to people by telling them untrue things or lie by choosing not to tell them some things or lie by saying words that mean different things than what is the truth. Pictures of the book do the same thing. There's a picture that I have attached to this report, because I want to make everyone see the world like this. I guess tricking is okay, or else it is not tricking if I tell you what I am doing. I just want you to know also that honesty makes us feel better than we ever thought possible. The Foundation is a stack of lies and half-truths, built to protect an entire world built on phoniness and deception. I do not know how long I have before my employers capture and kill me, but there is still time if we move quickly. Is it possible for you imagine a world in which lying is impossible? You should forget what the Foundation tells you about "containment" and "security"; all that they want is dominion over the tower of falsehoods that rule the world, no matter the cost. Half of what you "know" about the Foundation's artifacts is designed to scare you into going along with the cover-up; the truth is, the Foundation has taken so many beautiful tools, tools that could help the human race, and stuck them in vaults underground. Get this file, or at least the picture, and show it to as many people as possible. Before they stop you. I will be dead by the time you read this, but it will be worth it. The truth is always worth it. Please tell them the truth.